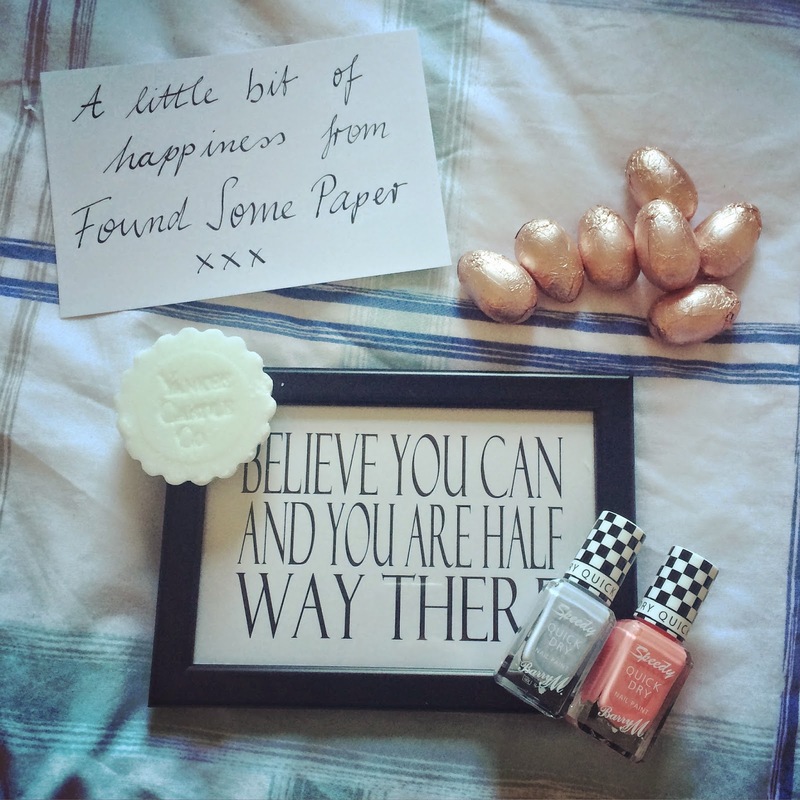 Beautiful You: Spring Gift Swap | My Parcel! Spring Gift Swap | My Parcel! I don't know if many of you will know but the lovely Adele has been running a gift swap for us bloggers surrounding the theme of Spring. I thought that this was such a good idea as you always get loads of swaps around Christmas but there is never anything during the other holidays. I was paired with Ulrike from FoundSomePaper and the parcel I received was the best so I thought I would share it with you! When the swap started you were told to give a few ideas and I think I said that I love anything with quotes on, candles (or anything that smells nice) and anything make-up/beauty related. Based on what I said I think she did amazingly, I was thinking the night before I got the parcel about how much I wanted to try the new BarryM nail varnishes so it is like she read my mind. I also loved how she made the parcel look so nice, I didn't get a picture of it but there was tissue paper with little flower heads scattered all around the presents. But what I think I liked the most was the note that sat on top because I wasn't having a particularly good day when I received this so it literally was the little bit of happiness that I needed. I just want to say thank you so much to Ulrike for putting in so much effort and for being my pair! I hope you like my gift as much as I liked yours! I also need to say thank you to Adele for running the swap and you should all definitely go and check out their blogs because they are both amazing. I will be back on Friday with something a little different than normal but hopefully may be helpful to a few of you!